Most visitors to Cornwall drive straight across Bodmin Moor on their way to their beach and surf resorts and give it scarcely a second thought. Even the fitter visitors, planning to walk, are probably thinking only of the Coast Path. They don't know what they are missing and I'm glad of that as it leaves the delights of the moor to the few who know it and love its wildness, its scattered settlements, its pleasing villages, its clapper bridges, its ancient rugged beauty and, most of all, its great range of antiquities. Here are a few of our moorland highlights. Hills: Brown Willy (1375') and Rough Tor (1325') are the highest and are musts, even though relatively popular. Stowe's Hill is also popular but is definitely a must particularly for its renowned Cheesewring rock column. 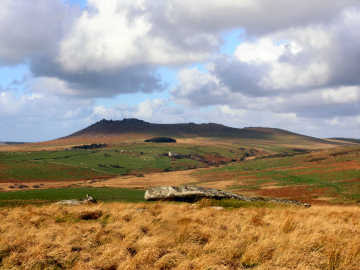 My favourite hills include rocky Kilmar Tor and Hawke's Tor and remote feeling Buttern Hill and High Moor. Above about 1000' you get immense views and that 'top of the world' feeling. Rivers: Between them the Fowey, Camel and De Lank rivers drain much of the moor; all rise in the north. The Fowey is the most scenic; you should not miss Golitha Falls, hidden in beech woods. 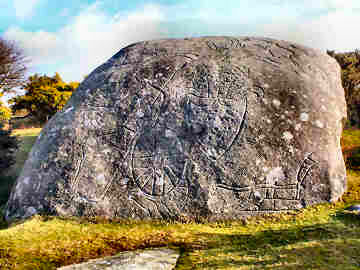 Antiquities: Easily accessible are the Hurlers and Pipers standing stones, Trethevy Quoit and King Doniert's Stones. 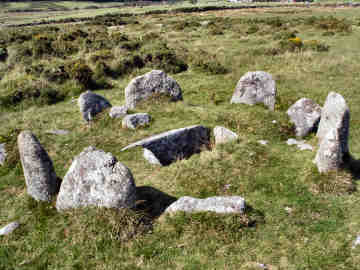 Less accessible are the Stripple Stones and Nine Stones circles and King Arthur's Hall. All over the hills are remains of prehistoric settlements and abandoned medieval villages and even abandoned Victorian farmsteads. Industry: Superb mine relics and mineral tramways near Minions village; china clay pits at Stannon, Glynn Valley and Whitebarrow; a working granite quarry at De Lank between Blisland and St. Breward. Walking: It's wonderful. See Walking Bodmin Moor for a few words of advice. Trails: Mark Camp's enjoyable Copper Trail circumnavigates the moor but is not yet waymarked. 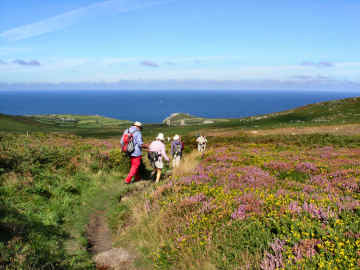 The Land's End Trail crosses the moor from St. Breward to Caradon Hill. 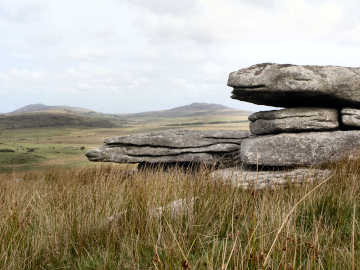 Most walkers on Bodmin Moor are there for the solitude and the wonderful scenery. It would probably never occur to the casual walker on the moor that it was formerly, since prehistoric times, a positive hive of industry. Yet you do not have to look far for the evidence of three major industries, two defunct, one still in existence in a minor way. Major industry was mining for tin and copper, an activity that lasted on the moor from the bronze age through to the early 20th century. 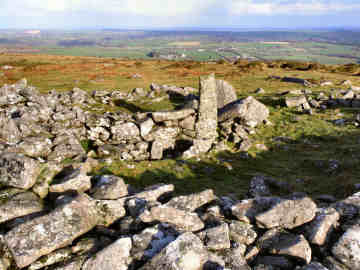 You can see evidence of early tin streaming on such hills as Buttern Hill and Leskernick Hill, both accessible from Bowithick. Modern era mining is best evidenced around Minions and the slopes of Caradon Hill. In the 19th and 20th centuries the china clay industry flourished on the moor, more than 20 pits having once operated. All pits are now closed but the best sites to see are Stannon Pit, best viewed from the heights of Roughtor, and Glynn Valley which you can access from the car park by the A30 near Temple. 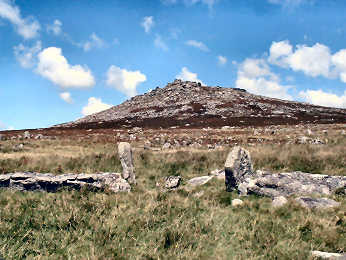 Granite is the one major industry that is still active on the moor. At different times there have been around 25 quarries on the moor, now only De Lank Quarry remains of the major quarries; you can walk right through it on a path between Pendrift and St. Breward. Also worth seeing is the defunct Cheesewring quarry below Stowe's Hill near Minions, nowadays the preserve of rock climbers. Other evidence of these industries can be found. Most obvious is the Camel Trail, an 18 mile multi-use trail once a railway carrying granite and china clay from the moor to the ports of Wadebridge and Padstow. High on the moor you can find former railways and tramways that carried tin, copper and granite. Best of these can be found around Minions and Caradon Hill, obvious from their relative straightness and the granite setts which remain in place. Best examples run from Minions, one to Cheesewring quarry at Stowe's Hill, one from Minions to Kilmar Tor by way of Wardbrook Farm, one from Minions to Crow's Nest (good pub), and one running round the north and east side of Caradon Hill. This is a very different sort of countryside to walk in. The Cornish Coast Path is totally straightforward, well waymarked and impossible to miss. Bodmin Moor is a very different matter. Away from the Open Access land, OS map 109 shows many footpaths. On the ground these are less easy to find, very few signed from roads as they are supposed to be. Some are overgrown, others may have been blocked by landowners, intentionally or otherwise. In places the only way you are sure you are on a path is if you can find the stile into the next field! The OS is supposed to show marsh as blue tufts; it doesn't always. And a lot of archaeological information is missing. The only route you can be sure of is Mark Camp's well described - but un-waymarked - Copper Trail around the moor's periphery. So, plan your walk carefully using OS Explorer 109. Take a compass, count field boundaries, be patient and, unless you want to trespass, be prepared to retrace your steps and try once more. If in doubt, ask a farmer, if you can find one. Most importantly, use Cornwall Council's Mapping web site to find Open Access land. But beware, on the Moor a lot of open access land fails to link with other such areas. If, like me, you enjoy antiquities, there are many more than shown on the map. 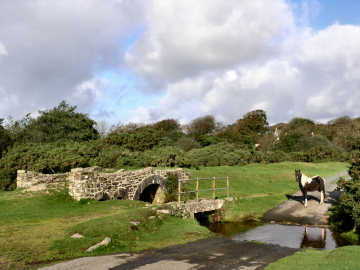 If you enjoy high moorland, remote farms, cattle, native ponies and sheep, you will love Bodmin Moor. 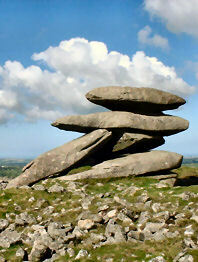 WALKABOUT WEST Mark Camp offers guided walks generally in Cornwall and especially on Bodmin Moor. Mark is one of the experts on Bodmin Moor: its history, its antiquities and its industries - tin and copper mining, granite quarrying and china clay production. Mark has also published a number of books about Bodmin Moor - three books of Short Walks, a new Introductory Guide and a guide to the trail that he devised, the 60 mile Copper Trail around the moor. I walked the Copper Trail in winter 2006. It was a very wet winter so I met up with an awful lot of mud along the way. Even so, it made for a very enjoyable few days, thanks to Mark's careful route directions and detailed maps and informative descriptions of all the interest to be found along the way. One way or another I have done most of Mark's Short Walks, sometimes with walks of my own devisng that coincide roughly with Mark's. The odd one, such as the one from North Hill, is tougher than you might expect but all are enjoyable. And I have particularly enjoyed Mark's March 2009 Introduction to Bodmin Moor. The recently introduced 'Right to Roam' legislation - long agitated for by the Ramblers Association, and initially opposed by many landowners - has resulted in vast areas of land all over England, Scotland, Wales and Cornwall being opened up to the general public. Essentially these rights are for walkers only - suits me. I used to find the Countryside Agency's Open Access website an immense help in my Cornwall moorland walking, not just on Bodmin Moor but also in West Penwith. Unfortunately the site, now Natural England, has been messed around with and although the maximum scale is acceptable, maps are too small and navigation is quite awkward. As a result, it is no longer worth, as a walker, using it in its current CRoW Access form. Fortunately, Cornwall Council has an excellent mapping web site, which I find better than the Open Access site ever was. It is easy to use, shows Open Access land, rights of way, path numbers should you wish to report problems, and is zoomable up to large scale. A word of warning on Open Access land. I soon discovered that this may not be quite as straightforward as that. I have encountered barbed wire fences, locked gates and even one gate on Bodmin Moor, leading to access land, that has a 'no walkers' sign on it. And, in West Penwith, where moorland is lower, I have often found impenetrable furze and bramble. So don't expect it to be easy. My earliest walking was done with Jane with the Independent Ramblers, based in Ealing. With them we learned to love the Chilterns and the Cotswolds. But we soon graduated to our own independent walks, first from walk books, later of our own devising. The Ordnance Survey 1:25000 series became our bible. The current Explorer series still is my bible (to a degree) particularly as it now shows Open Access land. But, as with the Bible, you learn not to believe every word. I use OS maps, GPS and compass on most walks, especially on Bodmin Moor and on the moors of West Penwith. But I have lost some trust in OS. Since completing Mark Camp's Copper Trail during winter 2006, I have been walking routes of my own devising on Bodmin Moor and have been horrified to discover just how unreliable the Ordnance Survey can be. A couple of walks in December 2006 proved that. Part of a path shown from Butterstor to Garrow simply does not exist yet OS quite fails to show a well waymarked path from Brown Willy to Garrow (and on to King Arthur's Hall). Below Garrow the OS fails to mark a footbridge over the De Lank River. 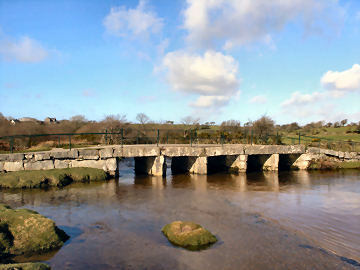 It also fails to show a wooden bridge and clapper bridge that cross the river at the southern foot of Garrow Tor. Elsewhere I have found marsh that isn't shown, probably because it is not low-lying. So be advised, take map, GPS and compass and expect the unexpected. I had only vaguely heard about Jubilee Rock when an article by Peter Davies appeared in the local North Cornwall Advertiser in February 2007. I was so fascinated that I had to go and seek it out in that same month. Finding things on foot being one of my joys, I parked in Blisland village, walked east to Casacawn, then north to Pendrift Downs. Surprisingly, there is no sign or clear path to the rock and one's approach may be obscured by furze. From there I continued on a round walk, north to Hantergantick Quarry, east along the de Lank River to Delford Bridge and north-west over Lady Downs to St. Breward's Old Inn for my usual excellent hot panino. To complete the walk I returned to Blisland on the Copper Trail route. The massive 8 foot high granite boulder was said to have been carved by Lt. John Rogers to celebrate the 1810 golden jubilee of King George III. If Rogers was the carver he must have been a skilled mason as the detail of all the work is still crisp after almost 200 years. All is apparently original except for an 1897 addition for Victoria's golden jubilee. Detail includes Britannia, the Royal and Cornish coats of arms and those of local families, a plough, and two mason's marks, a compass and square. 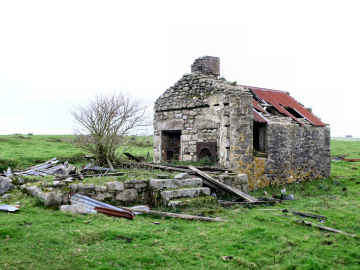 I agree with Peter Davies that it would be good to see a careful restoration completed by 2010 - and some furze cleared. 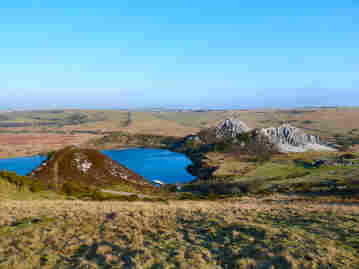 UPDATE JUNE 2011: I was back at Jubilee Rock in June 2011, researching a Bodmin Moor round walk starting from St. Breward and taking in De Lank quarry, Blisland, Jubilee Rock and Delford Bridge. I was surprised to find that the Rock had indeed been restored in 2010 to celebrate its bi-centenary. Lichen had been removed and the rock was looking sparkling clean. I was, however, puzzled to see that the carving had been infilled with what looked like grey paint. Is this not a Grade II listed structure? Is it permitted to paint it? And I was most disappointed to see that no furze had been cleared round it, something badly needed so that people can find the rock. I set off on this early July 2006 walk with no great expectations - except to find the Trippet Stones circle. In the event I extended my planned 6 mile walk - in glorious hot sun - to 8 miles to take in a lot that I had not expected to see or to be able to visit. I parked on the lane from Temple to the A30 westbound, crossed the A30 onto Manor Common, crossed the common, and discovered many restored boundary stones before I came to the Trippet Stones. I then expected to have to pass Carbilly Tor on my way to Bradford but discovered that its old granite quarry workings are now Open Access land. I continued past Carbilly Farm to follow the De Lank River to charming Bradford village. Lanes then led me to Carbaglet where I crossed grazing land (path dificult to find and seems to have been deliberately blocked) past Deacons and through Newton to Newton Downs. By mistake I then crossed marshy land to climb to Trehudreth and Greenbarrow Downs, an area covered with standing stones, cairns and barrows. Finally I crossed the A30 again (beware fast moving traffic) by Betty's snack shack lay-by to return to the car. A superb walk filled with unexpected interest. You will find images of boundary stones on my Miscellanea page. I had originally planned to do this walk - on a cloudy humid July 2006 day - from St. Breward. At the last minute I decided to start on the moor by De Lank Waterworks and make a round walk of it, taking in Bradford, Delford Bridge, Ladydown and St. Breward Churchtown, returning along the lane past Penwood and through Bolatherick. My decision was influenced by the chance of a break in St. Breward's excellent all-day Old Inn! Before getting properly underway, I headed downhill to find a nearby clapper bridge and was amazed to find a deserted medieval village not on the map. But then, neither were the lines of boundary stones between Ivey and Whiteheads - well done Ordnance Survey! By Whiteheads, open access land seemed - on the map - to link to a right of way down to Bradford. It didn't, so I guess I trespassed crossing a high hedge to find the track. I followed the track down to Bradford ford then back up to cross fields to find Delford Bridge where highland cattle cooled themselves in the De Lank River. Then more fields to cross Ladydown to Churchtown, where I looked in the church before heading down the lane back to Ivey. There I found that the 20 wild ponies I had seen galloping across Ladydown were now more than 40, grazing quietly. A great walk, around 8 fairly level miles - though with a lot of high stiles. This is a supposedly Arthurian location (but with no such real connection) that you cannot get to in a car. However, paths lead east to it from St. Breward Church for a little over a mile to Penwood House, then sharply north-east for another mile or so. You could shorten the walk by parking near Penwood House. What you find, when you get to the top of King Arthur’s Downs, is what may well be a prehistoric rectangular banked enclosure, around six feet high and some 160 feet by 65 feet. Inside is lined with apparently random stones, upright, angled or lying flat. A ditch once followed inside the rectangle, its course is marked by mare’s tail grass. Romantics would have us believe that the enclosure was once roofed but its sheer size makes that unlikely. However, the same sheer size suggests that it must have been a place of some importance and unlikely to have been only a stock enclosure. It still feels like a special place, perhaps because of its location. 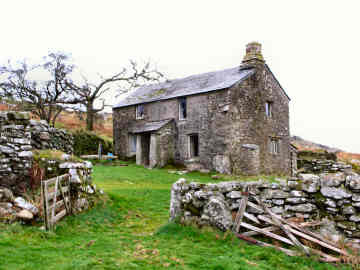 Despite knowing that farms and villages are not far away, you feel total isolation on the high moorland, your views of the higher land of Garrow Tor and Rough Tor only serving to heighten the feeling of isolation. Yet, look to the east and you will see isolated standing stones that may well have marked a prehistoric trackway over the moor. I have since discovered a similar but smaller enclosure on the edge of Smith's Moor at Trezibbet Farm at 20283/75596. 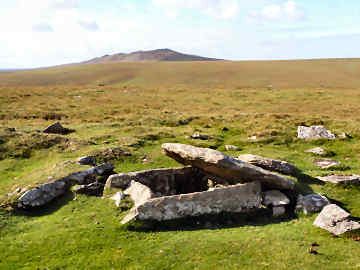 In mid February 2006 I was out again on Bodmin Moor, this time not on the Copper Trail but doing an out-and-back walk from near St. Breward in the general direction of Brown Willy. I had only planned to walk as far as Fernacre Farm, a mere three miles each way, but found the walking easy and continued beyond Brown Willy to the foot of Butterstor. Interest along the way was enormous. First ancient Middle Moor Cross, next the sight of the North Cornwall Hunt meeting by Camperdown Farm, then a small ruined farm, and then Fernacre Farm itself, newly tenanted after a long time empty. I asked permission to follow the track through the farm and found much beyond. Just below the farm is an impressively massive clapper bridge; a little further on are remains of medieval Brown Willy village, substantial but sadly overgrown and neglected; further yet, sheltering below Butterstor, are a goose shelter and the ruins of a medieval farm, used, to judge by corrugated iron on the roof, into the 20th century. On the way back I left the track to find some of Bodmin Moor's abundant neolithic and bronze age reamins. I found hut circles, a large stone circle and several cairns, one with the burial cist exposed and a couple of German visitors sitting on it enjoying their sandwiches! 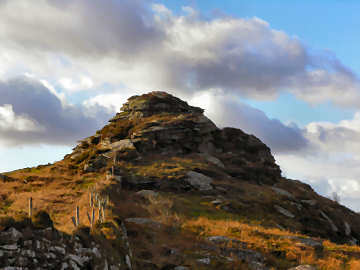 I had explored Garrow Tor briefly when doing my Garrow Tor and Hawk's Tor walk in September 2006. In the course of a walk from De Lank Water Works in August 2008 - intended to find an easy way over Butterstor - I had the chance to spend some time on Garrow Tor. As so often when you get above 1000 feet on Bodmin Moor, the views are stupendous - Roughtor and Brown Willy to the north, Caradon Hill to the south, clay country to the west and the Atlantic to the north-west. What took my interest this time was the vast amount of early settlement on the hill. There are several bronze age settlements with probably at least 100 hut circles remaining. There is a massive rock hedge snaking up the hill in a sort of crinkle-crankle shape, starting from where the path emerges from King Arthur's Downs after passing through the woods. On previous walks I had passed by Garrow Farm and been fascinated by it. This time I noticed substantial enclosures around it and later did a web search. It seems that there was a fair medieval settlement here to the north and west of the present farm buildings. If you are interested there used to be a fascinating 23 page PDF file about a dig there; try the link and, if you can find it, please let me know. It appears that the present post-medieval buildings are all that now remains of a much larger farm, still in use to judge by quad bike tracks. For this walk, done in September 2006, I parked by De Lank Waterworks, a handy spot I had used before, when doing a walk to Bradford and Delford Bridge. I set off north, over Emblance Downs and King Arthur's Downs, heading for King Arthur's Hall and passing a cist burial and small stone circle on the way. 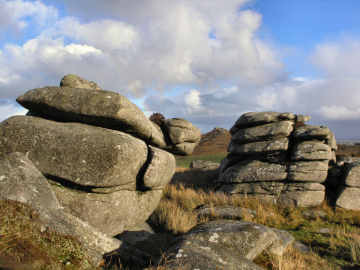 From King Arthur's Hall I headed east to cross a small stream and climb Garrow Tor, where I found considerable evidence of an old settlement and great views north to Rough Tor and Brown Willy. I then headed south from Garrow Tor to ford the De Lank River, cross Scribble Downs and climb Hawk's Tor (not to be confused with Hawke's Tor near North Hill, which we have walked previously). Looking SSE from Hawk's Tor I could see my final objective, a stone circle known as Stripple Stones. From the stones it was a simple matter to climb Hawk's Tor again to head north and then west over Carkees Tor to drop down past an abandoned medieval farm and cross the De Lank River again, this time by a clapper bridge, to return to the car. A most enjoyable walk, of around 8 or 9 miles. Sadly the weather was not as good as it might have been so the photo is a bit dull and brown, Bodmin Moor's default colour in poor weather. 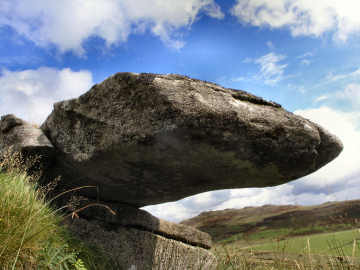 You will find an entry for the Stripple Stones on my Antiquities page. During school summer vacations we avoid the Coast Path for our walks because of the beach-bound traffic. 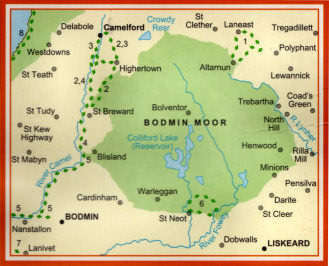 During summer 2004 we had taken to walking on the heights of Bodmin Moor. In August we walked from Minions to Crow's Nest and Caradon Hill and from North Hill to Hawke's Tor and Trewortha Tor, the latter from one of Mark Camp's Bodmin Moor walk books. At the very beginning of September we decided - with some trepidation because of the climbs - to try Roughtor and Brown Willy (the highest peaks on the moor) near Camelford. We climbed 500 feet to the summit of Roughtor and the same again to the 1375 foot peak of Brown Willy, highest point in Cornwall with views of both coasts. It all turned out to be easier than expected and we took in Louden Hill on the way back as well. The walk is chock-full of interest: magnificent pinnacles of exposed and weathered granite on the summits; remains of ancient settlements and stone enclosures in the valleys; two tiny tributaries of the River Camel, one the De Lank River, the other un-named; cattle, sheep and ponies grazing everywhere; ravishing views from the summits. We are now quite hooked on Bodmin Moor and plan to try other routes. There is a good car park; to find it follow signs for Tregoodwell and Rough Tor from A39 east of Camelford. Technically, this really is an 8 tors walk but only by counting Roughtor as 3 - Showery Tor, Little Roughtor and Roughtor. By map wheel it is just over 10 miles, on the ground at least 12. And what a walk: terrific views, sheep and ponies grazing, antiquities galore everywhere. Despite some 3000 feet of ascent it's by no means a difficult walk though a bit boggy over Butterstor and rocky on the Brown Willy ridge. Start from the Roughtor car park, head for Showery Tor and walk the ridge to Roughtor itself. Head back a little way to find the easiest descent, aiming for the bottom of the path up Brown Willy to find the ltitle bridge over the stream. Once on Brown Willy follow the ridge south to the southern cairn and then follow the waymarked path, a permissive one (south at first); this takes you down to the lane to Fernacre then up over Butterstor, down to the infant De Lank River and up onto Garrow Tor. Another waymarked path then heads west over King Arthur's Downs, past King Arthur's Hall and on to Middle Candra. Then it's north onto Treswallock Downs and Alex Tor (impressive cairns here) and down again and on to reach the entrance to Stannon china clay pit and the impressive Stannon stone circle (about 60 stones). Finally, skirt Stannon Pit spoil hills and climb Loudon Hill for its Logan stone. A great walk and one I shall do again - I did, so see the box below. A slightly longer version of this walk, including St. Breward, is at St. Breward Walk 04 or at Camelford Walk 04 on my Bodmin Moor Walks page. It has full route directions including GPS information. For this December 2006 walk I parked at the Jamaica Inn at Bolventor, just off the busy A30. The weather proved to be something of a mixed bag: on the first hill, hail and a biting wind produced a freezing wind-chill, later warm sun was interspersed with cold driving showers. My route took me down to Dairywell Hill Farm, up a sunken lane on to Tolborough Tor and down towards Catshole Downs. All familiar territory from a previous walk from Bolventor but then I headed into new territory over Catshole Downs and up over the gentle southern flank of Brown Willy. Then down to abandoned Brown Willy Farm and along a track to Butterstor Farm, both familiar from my Fernacre walk, before climbing Butterstor and heading south. It was here that I made the day's serious mistake. I assumed I could easily cross a usually tiny stream to get onto Shallow Water Common. I couldn't and, after boggy struggles along the swollen stream, I had to head into dark and forbidding Priddacombe Woods to emerge onto a farm lane back to the A30 and Bolventor. I should instead have crossed the De Lank River ford at the southern foot of Garrow Tor to access the Common over Scribble Downs. I shall do this walk again and get it right then. I made up for it with a hot mince pie and clotted cream at Jamaica Inn, not my favourite place but useful. A few days after my struggle to get onto Shallow Water Common, I returned to have another go at this one - and to try to get it right this time. Partial success - but you learn all the time. Same route to the top of Butterstor but then I found a permissive path, that starts on Brown Willy, that took me to Garrow Farm. Then down Garrow Tor's southern slope to use a ford over the De Lank River that I had used on a previous walk to the Stripple Stones. On that occasion it was easy to cross. This time the river was in spate and I managed to tumble off a rock and fill my boots. Then, of course, I discovered that only fifty yards away were a clapper bridge and wooden footbridge, not shown on OS109, that I could have used. Oh well! At least I got it right from there. Up on to Shallow Water Common and Brockabarrow Common (keep to the highest ground possible to avoid the boggy parts) and back to Jamaica Inn along Sprey Moor. 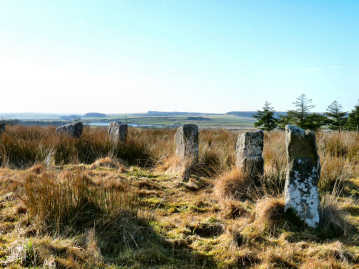 An amazing collection of antiquities on Brockabarrow: hut circles, two or three probable cairns, and a long line of simple boundary stones. And on Shallow Water Common I found signs of what appeared to be very early mining. Back at Jamaica Inn I celebrated - in front of a roaring log fire - with two mince pies and clotted cream. 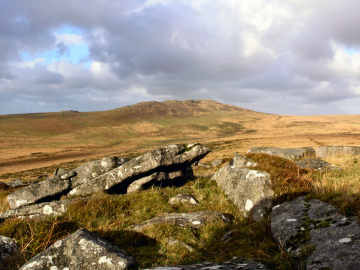 In 2004 Jane and I had walked Rough Tor and Brown Willy from the car park on the Camelford side. At Easter 2006 I decided to approach from the other direction. I parked at the Jamaica Inn in Bolventor, just off the busy A30 highway. Bolventor is an odd village. Its only purpose seems to be as the location of Jamaica Inn - made famous by Daphne Du Maurier's novel. Once busy with coaching traffic on the way across Bodmin Moor, it is busy now with tour buses - there for the name and the Smuggling Museum - and motorists desperate for refreshment before their holiday destinations. Even odder, church and former vicarage are separated from the village by the busy A30 and are now well over half-a-mile away on foot. I didn't like Jamaica Inn, despite a good pasty there after my walk, but I did enjoy the walk. As soon as you pass Dairywell Hill, a track that may once have crossed the moor to Camelford leads up onto open access moorland. From the top of Tolborough Tor you can see the track and boundary bank heading past Brown Willy. Two stiles lead to south and north ends of Brown Willy. 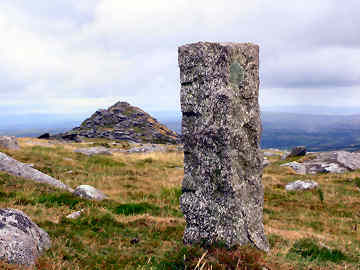 At the 1375 foot summit are a trig point and a modern cairn, topped by a small stone cross. 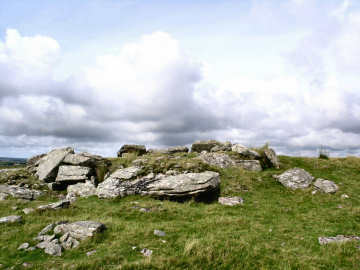 The southern summit is topped by a bronze age burial cairn. Another enjoyable Bodmin Moor walk, this one in mid-August 2006 on a dull day, hence dull photos. I spotted Lanlavery abandoned medieval village in my Cornwall's Archaeology booklet and decided to make a round walk from Roughtor car park using the Open Access land linking Roughtor with Davidstow Moor. My route - around 8 miles - was up over the rocks to Little Roughtor, along the ridge to Showery Tor, down to the western edge of Roughtor Marsh, over the hill to Lanlavery Rock and the village remains, then east to walk up through Oldpark, which I had missed on an earlier Copper Trail walk. A straightforward return took me through Davidstow Woods - a strange place with the remains of runways of the old Davidstow airfield - and along a lane back to Roughtor Car Park. Lanlavery village is now only bumps in the ground where house walls stood. Oldpark, to judge by the height of its massive hedges, may once have been an enclosed deer park. A fully detailed longer version of this walk can be found on my Bodmin Moor Walks page as Camelford Walk 03. 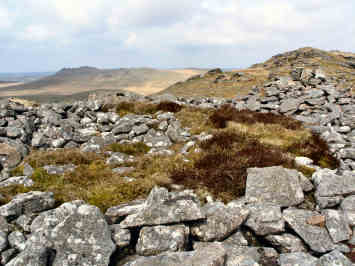 This Bodmin Moor walk, first done in October 2006, was the wildest and most exhilarating I have yet done on the Moor. It was prompted by reading that there is supposed to be a 'quoit' on Leskernick Hill. There isn't, only an angled rock that, from a distance looks as if it could be. From interest I read an article by romantic archaeologists from University College London who seem to believe that every stone on the hill was positioned by early man. Some certainly were as there are two settlements of round houses and some large walled enclosures. I suspect that, if the 'quoit' is man made, it is 19th or even 20th century. I started my walk at Bowithick - passed through on the Copper Trail - and headed up Buttern Hill, past evidence of mining or quarrying, to find a row of cairns and an exposed cist on top. 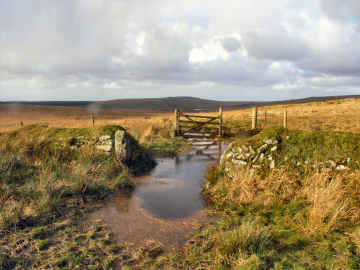 Then down past the source of the River Fowey - the moor was originally called Fowey Moor - on to High Moor. Down again to cross a ford and on up Leskernick Hill, below it an isolated farm, two miles from the nearest lane. Down again to climb The Beacon and down yet again, to cross a narrow stream near abandoned Cannaglaze Farm, then up on to Bray Down before my final descent to Bowithick. A very highly recommended walk, just under 8 miles and with glorious views. Some 2000 feet of ascent but none of it difficult. A fully detailed version of this walk on my Bodmin Moor Walks page. One of the great delights of Bodmin Moor - the same is true of the coast path - is that you can revist the same walks time and again and see the moor with different eyes each time. That's one of the reasons why I am so pleased that my sisters - Mary and Frances - have taken to joining me occasionally on my moorland walks. On this occasion Frances was staying for a few September 2007 days and I was able to see this glorious walk through her eyes as well as mine. We parked at Bowithick Bridge - a delightful spot for coffee from a flask before and after a serious walk - and followed my previous route: Buttern Hill, High Moor, Leskernick Hill, The Beacon and Bray Down. I delighted in showing Frances the cairns on the hills - particularly the cist on Buttern Hill - and the Leskernick tin streams. Through her more artistic eyes I was able to get new enjoyment from sculptural rocks and cloud formations. It is strange how the memory can play tricks on one. I had remembered neither that between High Moor and Leskernick Hill there is some really boggy ground to cross around the infant River Fowey, nor how awkward the descent is from the trig point on Bray Down. No matter, it was a quite wonderful walk with superb panoramas from every hilltop. This is one of those hidden parts of the Moor where you would almost have to be lost in order to find it. When I first went there, I took the narrow lane only as a short cut. I then got stuck in a Cornish traffic jam - a flock of sheep being moved slowly from one field to another. Through the village, I happened on a real oddity. At the bottom of the valley, the road crossed a water-splash. On either side was a bridge, one side just a simple granite clapper, the other a rather elegant but badly damaged road bridge, probably abandoned when maintenance became too costly. This is a charming and tranquil spot but not that easy to find without a good map. Bowithick revisited 2007. The more I see of Bowithick, the more I like it. It all looks so rural and so natural, as if it has not changed in hundreds of years. Yet there are signs of industry here. If you take the path that leads up Buttern Hill you will find signs of quarrying or mining - and the footings of an abandoned Vistorian building. Close to the ford, and sunk into the grass, are odd small granite chambers whose purpose I cannot even guess at. And I now suspect that the abandoned bridge - there is another on the Buttern Hill track - may have been built to carry the materials to construct the extensive farm buildings just up the hill. It was a pretty unpromising day in October 2006 when I set off on another Bodmin Moor walk, this one primarily to seek out the old Glynn Valley China Clay Works. Having parked off the A30 at Temple, a solid downpour delayed me for half an hour but then the skies cleared and after that sun and showers competed. I headed first up Colvannick Tor where I found scanty early settlement remains, then on up St. Bellarmin's Tor by way of an old granite quarry. Between St. Bellarmin's Tor and Great Care Hill - where the china clays works is - is a rifle range and, although I could have cut across as there was no activity, I preferred to to head south to Fore Downs and then north-east to Great Care Hill, passing herds of ponies on the way. Finally I headed west up onto Cardinham Down and north back to my car park near Temple. Altogether about 6 miles with some long views, mostly north to Roughtor and Brown Willy. Glynn Valley China Clay Works was opened some time before 1880, initially on a very small scale, as you can tell from some of the ruins, but was later enlarged. I don't know when it closed. Some remains are grassed over, some walls stand and the office building is still intact. 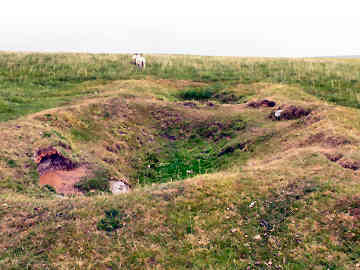 There is a large blue-gray pool and several conical white 'alp' spoil heaps. I did a similar walk to this in January 2009. This time I looked first for the remains of Burnt Heath china clay works on the way up Colvannick Tor. I had passed them before, noticing only the lake where the pit was once worked. Then on Colvannick Tor I identified the stone row shown on OS109. I think I found eight stones, some recumbent, but it is difficult to be sure as furze intervened in the row. This time it was a glorious, but bitterly cold, day and I was able to get decent photos of Glynn Valley China Clay Works; one appears on this page in the item on the moor's industry. On my way back to the car I took a route from Glynn Valley over Little Care Hill. I was intrigued by the small rocky tor, which might have been incorporated in a burial cairn, and by a curving ditch at the northern foot of the hill which might possibly once have been part of a fortification. Could it be that 'Care' is a corruption of Caer and that there was once a fort here? It's not marked on OS109..
Not too much about this one, it was not a very special walk but offered around six miles on ground rising only to 900 feet, with only a moderate amount of interest and relatively minor views - the inevitable Roughtor and Brown Willy in the distance. I parked at the north western Colliford Lake car park and set off towards Colquite farm, skirted that and then followed the lane to Temple bridge, then up onto Blacktor Downs. Down and up again onto Hardhead Downs, then down to Higher Dewey farm - a clapper bridge here - and back over Redhill Downs - most of the walk on Open Access land. Interest on the way included abandoned farmsteads near Colquite and on the way up Blacktor Downs and extensive mine workings - back-lode pits - on Hardhead Downs. 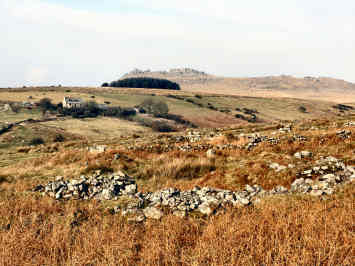 There are also settlement remains, hidden by bracken, on the top of Blacktor Downs. And there are boundary stones near attractive ancient Temple Bridge (this was once on the main highway through Cornwall, though that's hard to believe) and on Redhill Downs. Full directions for a Round Walk including Hardhead Downs. Of course, we walked when my sister Mary visited in April 2006. We had a fine day for a repeat of our Chapel Porth and St. Agnes walk but not for a Bodmin Moor walk. We set out from Bolventor to take in Dozmary Pool and Colliford Lake in the course of climbing Brown Gelly. The weather socked in and Brown Gelly disappeared in cloud. When I first posted this item I put up images of Dozmary Pool on the left - where Sir Bedivere threw King Arthur's Excalibur (the other claimant for this is The Loe) - and drenched Highland Cattle by Colliford Lake. Since those photos taken in the appalling weather were really very poor, the image on the left is one taken in January 2007 on my later solo walk that was undertaken primarily to visit Carneglos but also included Dozmary Pool, happily in sun this time. 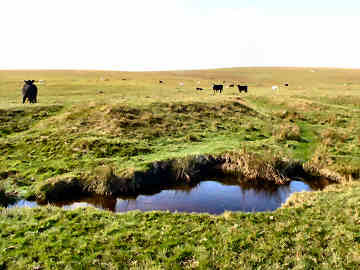 Tennyson's description in Idylls of the King, The Passing of Arthur is taken by some to suggest Dozmary Pool as the location where Sir Bedivere threw Ecalibur into the water. "On one side lay the ocean, and on one lay a great water." Assuming Dozmary Pool to be the great water, Colliford Lake would have to be the ocean. However, it wasn't there in Tennyson's time, let alone Arthur's. The far better alternative is The Loe on the Penrose Estate near Helston. This walk, done in January 2007, took me over some ground I have walked before but served its purpose of introducing me to Carneglos. I parked at Jamaica Inn at Bolventor - a convenient spot for coffee or a snack - and made a circular walk of it. I set off on the minor road to Golitha Falls and at Dryworks Farm (suggests a tin streaming connection) turned north east on a well marked path through the farm, down a sunken green lane to cross a wooden footbridge over the little River Fowey (OS 109 just says 'ford'!) and up onto Carneglos. Then south by Smith's Moor and Tresibbet Medieval Village and down a track by Trezibbet Farm to Dozmaryhill. Over Dozmary Hill to Dozmary Pool and back on the road to Bolventor. On Carneglos I was looking for the signs of a bronze age settlement. They were clear enough but, not knowing it existed, I didn't spot a small probable stone alignment photographed by Mr. Hamhead on The Modern Antiquarian. I did wonder if two massive lintel-like rocks might be the remains of a cist. The tor itself - the name means church rocks - offered good views to Brown Willy (as so often). Tresibbet Village was there OK but overgrown with little to see except possible longhouse walls, though I did spot a boundary stone there - and wondered about a former settlement by Trezibbet Farm. When my sister Mary was here in winter 2006 we set out from Bolventor to walk by way of Dozmary Pool to climb Brown Gelly. The weather socked in and Brown Gelly disappeared completely. We decided, discretion being the better part of valour, not to try and restricted ourselves to a misty walk mostly on the lanes. In October 2006 I decided to try again, this time parking at the southern end of Colliford Lake. This time I had better luck with the weather though heavy high cloud meant dull photos. So, when I was off to take another look at Goodaver Stone Circle in January 2009, I decided to park at Colliford Lake again and make my way to Smith's Moor by way of Brown Gelly. This time the weather was glorious. I took the track to Lord's Park Farm (views of Park Lake on the way) then headed north to pick up the massive hedge, entering the site through a gate about level with the central of the five cairns. This is so impressive a site that I wondered whether the hedge might even be old enough to relate to the cairns, perhaps as a giant enclosure. Views from up here - at around 1100 feet - are superb, taking in Caradon Hill, Stowe's Hill, North Hill, Brown Willy, Roughtor and Clay Country. On my way to Goodaver Circle, I left by the far north-east corner, on to a lane leading to Harrowbridge. I was first here in October 2006 on a dull day. 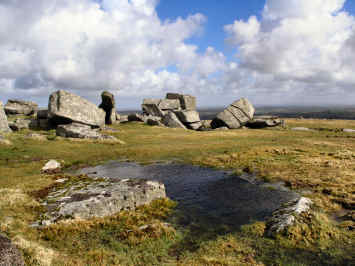 I returned in January 2009 on a gloriously sunny day, the perfect conditions for enjoying the wonderful views that the high ground of Bodmin Moor offers. There is a lot of doubt about the legitimate way to gain access to Smith's Moor, where the circle stands. I think I have at last solved it. You need to approach from the Bolventor to Draynes Bridge road, where the nearest practical parking is by the former chapel at Harrowbridge. Walk north for about 1200 yards and turn right up the lane to Trezibbett. Official access is, I think, up to the farmhouse then bear left through a gate on the track shown on OS109. The farmer seemed quite happy with my taking this route. Two problems: first you have to traverse a messy chicken area, then the track is blocked by a low bank and ditch, easily enough climbable. The track continues to a gate by a cow barn. Once through the gate, head east for the better ground and follow the fence south to the end. Finally, work your way round a low fence and you are in the site. According to Megalithic Portal the circle was re-constructed in 1906. MP suggests 25 stones but I counted only 23, one broken and recumbent. It's a difficult site to photograph, thanks to rampant marsh grass and surrounding conifers, but it's worth it for relative completeness of the circle, even if access proves to be a bit of a struggle. 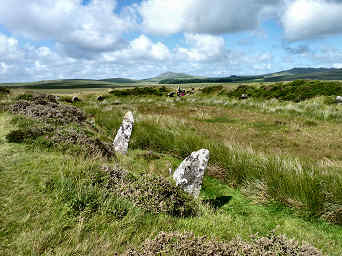 Goodaver Stone Circle is the subject of a fully detailed round walk on my Bodmin Moor Walks page. This round walk includes an improved route from the road at Trezibbet up to Goodaver Circle. This was one of those walks, my first of December 2006, of which I had no great expectation but which turned out to be much more interesting than I could have hoped. I parked at one of my favourite spots, the free car park, so beloved of dog walkers, at Draynes Bridge, from which we have strolled to Golitha Falls many times. Low expectations were due partly to the amount of road I would be walking, partly because on Hilltor Downs and Draynes Common I would only be up at 1000 feet and might not have much in the way of views. In the event the walk exceeded my expectations. From the Draynes Bridge car park I followed the Bolventor road, alongside the River Fowey, for 3 miles, then crossed a clapper bridge up to Carkeet Farm - a fascinating place - and asked permission to pass through the farmyard to go up Hilltor (not knowing an official route). I enjoyed the views from the rocky crest before heading back down. On my return I left the road just after Westerlake Farm to climb on to Draynes Common - of little interest except for one boundary stone - then followed a track that brought me down to the lane to Draynes Bridge just east of Draynes. A better walk than expected and little traffic on the Bolventor road. Nowhere to eat but Jane makes good sandwiches. Another way up on to Hilltor Downs. I have long been puzzled about access to Hilltor Downs as, I know, has Bodmin Moor expert Mark Camp. In February 2009 I think I found it. In a walk from Minions I took the track NW to Goldiggins Quarry and continued NW over the northern summit of Craddock Moor (334 metres). NW still to the very NW corner of the Open Access land. Then through two gates and onto the Open Access land of Sibleyback Moor. I then turned NE on to the former tramway below Newel Tor to a gate into Smallacoombe Plantation (This may not have been legal as this Forestry Commission land shows no rights of way - but I see no harm in gaining access). Evading the quagmire of the first 200 yards, I then turned W on a metalled logging track uphill. At the T junction (gate on right) I turned W again and soon took a grassy track SSW. At the end of the track, lo and behold, an open wooden gate onto Hilltor Downs. In early April 2006, having finished walking Mark Camp's fascinating Copper Trail, I went back to Five Lanes to investigate an area that had attracted me when studying the Ordnance Survey map. This lies just off the Copper Trail, to the south of Five Lanes and the A30 highway. In a fairly complex walk, starting from Five Lanes, I took a lane through Tregirls and up onto the moor at Eastmoorgate, having checked first that East Moor is an unrestricted open access area. Once on the moor I headed up 1100 foot Fox Tor - great views in all directions - where there are traces of a boundary bank and the outlines of former long houses. Then westwards to find what had been a massive boundary bank and on southeast up another hill for a stone row and a couple of degraded cairns. 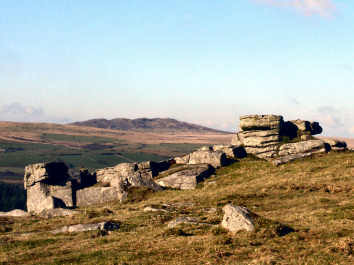 South then for the Greymare Rock (not really an antiquity) and hut circles on Carey Tor. Finally northeast to find the Nine Stones circle. My one failure was that I could not find a line of Altarnun parish boundary stones, though I had previously found one near Clitters on a Copper Trail walk. (See next entry, when I found it) A great walk and fascinating, if mostly rudimentary, remains. Afterwards I enjoyed another great beef and onion baguette at the King's Head at Five Lanes. 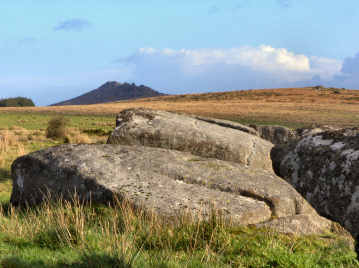 A round walk with detailed directions, taking in Fox Tor, East Moor and the Nine Stones, is on my Bodmin Moor Walks page. On a bitterly cold, but gloriously sunny, day in January 2009 I decided to revisit Fox Tor and East Moor. This time to try to find the long line of boundary stones, marking the boundary of the parishes of Altarnun and (I think) North Hill. Again, I parked at Five Lanes and approached Fox Tor from Eastmoorgate. When I had looked for the boundary stones before I had started in the south-west, south of the Greymare rock. This time I headed from the East Moor ring cairn east towards Ridge and easily found the stones on a low ridge running north-east directly towards the Nine Stones of Altarnun circle. At the circle the row veers a bit east and heads downhill to the corner of Clitters Plantation and on to the path from Newton to Clitters (part of the Copper Trail). 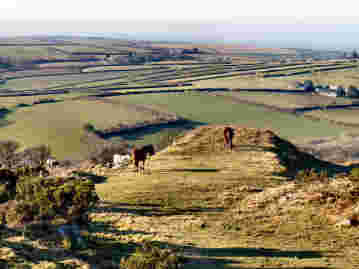 As on Fox Tor, East Moor, Carey Tor and Ridge, there is a lot of archaeology on Clitters Hill. 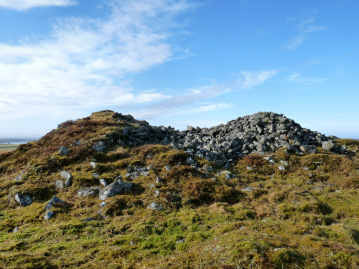 Not just that shown on OS109 - settlement, field system and hut circles - but at least one more probable cairn. At the path below the hill I then took a field path north down to a ford and a wooden footbridge across the little River Lynher. I then found Upton Castle; on private land. It is very badly overgrown but seems to be a small 'keep and ringwork' castle. I made my way back to the car by Upton Barton farm and paths to Trenilk. A wonderful day for moorland walking in September 2006, sun shining, gentle breeze, temperature in the mid 60s. All that and great walking on high moorland with antiquities everywhere. I did this as a 9 mile round walk from the car park at Siblyback Lake. First I climbed Tregarrick Tor then set off across extensive Craddock Moor, which extends from Minions village north to Siblyback Moor and the unpleasant Smallacombe Parks coniferous plantation. I then walked up through the plantation - probably not legal - and, after an awkward stream crossing, out on to Trewortha Tor near 'King Arthur's Bed'. I returned over Twelve Mens Moor, skirting Kilmar Tor and Langstone Downs to Wardbrook Farm, then skirted Stowe's Hill to cross Craddock Moor again, past Goldiggins quarry. As so often on Bodmin Moor, views are glorious by the time you get to 1000 feet. And, as always on the moor, the way was littered with prehistoric and medieval remains. 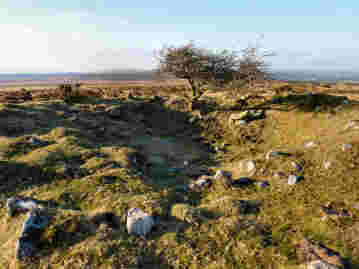 Settlement sites, hut circles, cairns, a stone circle, standing stones, an abandoned medieval farmhouse at Lambadla, others at Siblyback Moor and Smallacombe, a burial cist on Twelve Mens Moor, a flooded granite quarry on Craddock Moor. The oddest thing of all, high on Craddock Moor, in the middle of nowhere, was what looked like half a cider maker's apple crusher. What on earth was it? I can't imagine an orchard up there! 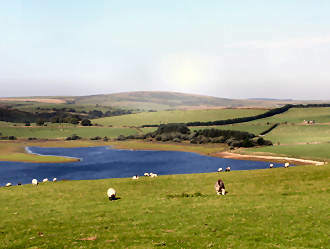 Detailed directions for a round walk from Minions, including Craddock Moor and Siblyback Lake are on my Bodmin Moor Walks page. Depending on your preference and the time available, the walk can vary from 5 to 10 miles. 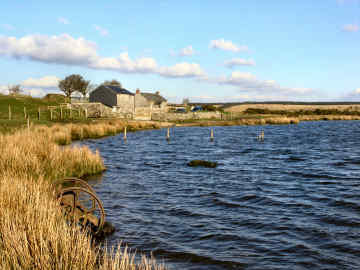 A small reservoir in a Bodmin Moor valley, below Tregorrick Tor, Siblyback Lake has a small watersports centre offering qualified tuition in canoeing, dingy sailing and wind-surfing. You can hire a row boat and fish for rainbow trout. There are good changing and hire facilities and a decent café with hot food most of the day. Looks a good place. In 2006 I parked here for a Craddock Moor walk, parking charges were reasonable then and still are in 2012. A circuit of the lake, on a cycle path, is about 3 miles. September 2012: The above very brief description was written in September 2006. Since then I have been to Siblyback Lake many times, some with Jane, some alone in the course of walks. Together we have walked around the lake; a board tells you it is a 2 mile circuit, in fact it is 3 miles. It is a pleasant enough, very easy level walk, best when there is plenty of activity on the water. We revisited in early September 2012 and discovered that a new activity had started in July. We had never heard of wakeboarding before. Apparently the standard form is simply a type of water-skiing, towed behind a fast boat. 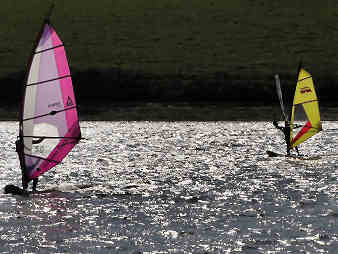 At Siblyback it is a closed course with jumps, around which the wakeboarder is towed at speed by an aerial cable system. Sadly it was maintenance day; we have since returned to watch the activity taking place, quite impressive..
By this time - August 2006 - I have become completely hooked on Bodmin Moor walking. Totally different from the Cornish Coast Path, invariably quiet - on this 5 hour walk I encountered no other walker - and, once you get up on the moors proper, the feeling that you are on top of the world. This walk was done from Minions - ample parking and refreshments - heading north to take in Kilmar Tor, Bearah Tor and Sharp Tor. There was also marsh, but that was my mistake as I was too far west. My way was dotted with boundary stones. From Minions I set off up the tramway to Sharptor village and Wardbrook Farm. It was here that I went wrong. A farmyard gate has a 'no walkers' sign. That's the one I should have taken. Instead I took what seemed an obvious track past the farmhouse and, in a mile or so, I was struggling over part of Witheybrook Marsh. I came out at Trewortha Farm, a 'Bronze Age Adventure Centre' and made my way up Kilmar Tor from the north side. There I found a tramway running round the hill. The Moor is criss-crossed by them. If you can find them - few are on the map - they make for easy walking. Once up Kilmar Tor, I was on top of the world as I continued from there to Bearah Tor, Sharp Tor and Langstone Downs, the latter topped by massive stone cairns. I then found the track I had missed earlier for an easy walk back to Minions. A wet walk but a great one, without a doubt. This is a walk that I happily return to time and again. I first went up Stowe's Hill with Jane back in 2002. Not long after that, soon after learning about Mineral Tramways, we first walked from Minions to Crow's Nest and back over Caradon Hill. The tramway from Minions to Crow's Nest is at the start of the Copper Trail, while a route below Stowe's Hill is at its finish. In 2006 I introduced both my sister Frances and my old friend Craig to the delights of the full walk. In each case we parked in Minions and walked by way of the Hurlers and Pipers stones to approach Stowe's Hill from the west, continued north to Wardbrook Farm then took the quarry tramway back to Minions. Then we headed down the 'Gonamena Incline' tramway to Crow's Nest, up the valley into South Caradon Mine, through the mine workings to Tokenbury Corner, and finally over Caradon Hill, past the great television mast, to return to Minions. This is walk of many delights. Its 8 miles, despite climbing two fairly considerable hills, are easy going. The way is full of antiquities, of views, and of mine relics. And, for one like me, there is the added bonus of cafés in Minions, free parking there, and the always excellent Crow's Nest Inn at just the point when you are ready for lunch. And last time, with Frances, we at last found Daniel Gumb's Cave. Detailed route directions for a short Stowe's Hill walk and for a short Caradon Hill walk are on my Bodmin Moor Walks page. The two can be linked to make a superb, interesting and scenic moderate length walk. Mid-January 2007 and the one sunny day in a wet and windy week tempted me onto the moor. My destination was Trewortha Medieval Village, which I had stopped short of on a two previous walks. 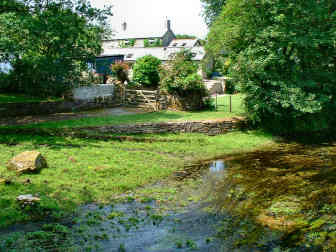 The village remains are at the northern end of Smallacoombe Plantations, close by Rushyford Gate. This time I decided to approach from the east and parked at Tolcarne. It may have been a bright, sunny day (apart from a stinging hail shower) but lanes, tracks and hillsides were running with water. My route, up over a hill called Ridge and by Carey Tor to Rushyford Gate, then back by Tresellern and Stonaford, offered me a couple of unexpected bonuses. It took the use of a stick as well as my pole to cross the ford at Rushyford Gate and, though I believe I was trespassing, an easily opened gate was an invitation I couldn't refuse. Trewortha village was worth it, walls of several long houses five feet in height and several enclosures. My bonuses were the impressive robbed out cairn on Ridge and an unusual stone cross on the hill's southern slope, unusual in that it is a simple Greek cross of three carefully squared stones. On my way back, from below, the cross seemed to be within a long ovoid enclosure! I wondered whether that was significant. An enjoyable walk of 6 or 7 miles, easy going but very wet in places. August Bank Holiday weekend 2004 - usually the busiest weekend of the year in Cornwall - so we decided against the Coast Path in order to avoid the traffic heading for the beach and headed inland instead, to the far eastern edge of Bodmin Moor where we parked at North Hill village and followed a walk from Mark Camp's 'Best of Bodmin Moor'. First we crossed the infant River Lynher (it joins the Tamar by Plymouth) by a strange 'wobbly bridge' - which did. Then up through pasture and woods and along a lane to reach the open moor. Mark Camp describes the walk as 'strenuous' and so it was, not so much through the ups and downs (height difference only around 600 feet) but on account of the rocky and boggy ground. Up on the moor we circumnavigated Hawke's Tor and headed up Trewortha Tor, adding a couple of miles to make it a six-mile walk. 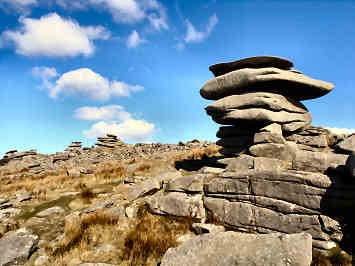 Like all the tors of Devon and Cornwall, at the top were strange formations of stratified exposed granite, some rocks shaped like stranded wales and dolphins, some of them balanced precariously ('logan' rocks). We returned along the course of the Withy Brook, through rampant bracken, over some very boggy ground and past grazing cattle, then through a muddy farmyard and finally up the Lynher valley back to North Hill. Food available at Racehorse Inn. Park by North Hill village hall. Although only 2½ years since I was up here with Jane I decided to revist these tors in December 2006, partly for themselves, partly to extend the walk to search out King Arthur's Bed and the abandoned medieval village of Trewortha. I failed in both those objectives but had a great walk in a mixture of glorious sunsine and showers of stinging hail. As before, I parked by North Hill village hall and followed Mark Camp's 'Best of Bodmin Moor' route as far as Hawke's Tor. I then climbed Hawke's Tor and headed west to climb Trewortha Tor and continued west down and up again to the far end of the ridge. Here I should have found King Arthur's Bed but realised I didn't know what I was looking for. Having found a photo on The Modern Antiquarian, I shall find it another time. From here I had intended to cross the Withey Brook and find Trewortha Medieval Village in Smallacombe woods. But, looking down at Rushyford Gate, I saw the fields flooded and decided against any more bog-hopping. So, after walking down to the brook, I sought the easy way out and took the direct route back to North Hill through Trewortha Farm. I had been there on a previous walk and had been amused by the almost sculptural junk but I hadn't seen a couple of boundary stones that I noticed this time.